Enjoy this amazing kale sauté packed with vitamin B-12 and protein for those of you looking for an alternative to soy or meat products! One serving of kale contains 5% of your daily fiber and 2 grams of protein!!! It is also anti-inflammatory, high in omega fatty acids, rich source of immune boosting carotenoids and flavonoid antioxidants including vitamins A and C, and high in calcium. Kale contains more calcium calorie per calorie than milk and kale is more sustainable then animal products. Try it and let me know what you think! -Coconut oil in pan 1 tsp. 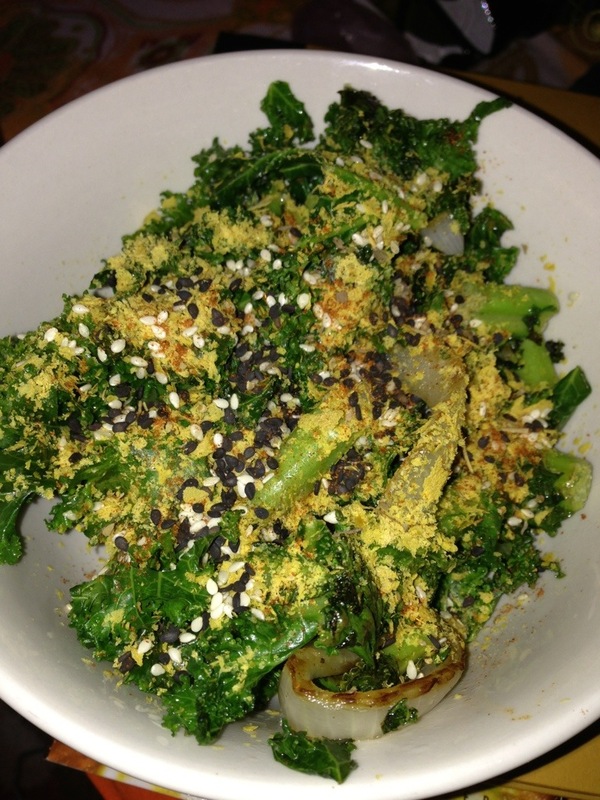 -put the sautéd veggies in a bowl and top with nutritional yeast, Italian seasoning, cayenne, and sesame seeds. Serve and enjoy all the yummy flavors!